Noble Co. PLC (NE) Position Reduced by Speece Thorson Capital Group Inc.
Ahold Acquisition of Delhaize Creates Huge Grocery Chain in U.S.
Ahold the supermarket operator based in the Netherlands and Delhaize Group based in Belgium announced on Wednesday they had reached an agreement to an all-share merger, which would create one of the largest chains of supermarkets in the U.S. This deal would combine Belgium’s Delhaize, which is the owner of Hannaford and Food Lion supermarket chains in the U.S., with the Dutch Ahold, which is the owner of Giant and Stop & Shop supermarkets in the U.S. The newly combined company would be known as Ahold Delhaize and be worth an estimated 26.1 billion euros or equal to approximately $29.5 billion. It would encompass over 6,500 stores and more than 375,000 employees in Europe and the United States with total sales of over 54.1 billion euros. Even though both companies are based in Europe, they generate over half their total sales across the U.S. The deal should allow them to compete on a better scale with stores such as Walmart, the largest retailer in the world Lidl and Aldi from Germany and Costco in the U.S. 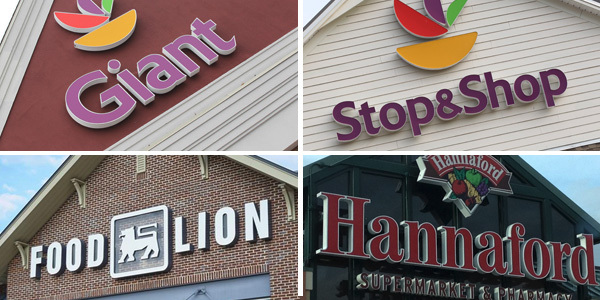 In the U.S., grocers in the middle tier such as Stop & Shop and Hannaford have had to absorb much higher costs from their suppliers to keep their prices competitive. Some of their shoppers have turned to other places like Costco during the recession and never returned to their stores. Grocers also have faced pressure from the larger retailers that have more pricing power made the sales of groceries a bigger mix of their overall business of late such as Target and Walmart. During the first quarter, the pricing pressure cut into margins at Ahold across the U.S. with sales dropping close to 2%, which equals almost 7 billion euros. Delhaize and Ahold said they anticipated annual savings of 500 million euros by only the third year following the close of the transaction and a one-time costs of 350 million euros following the merger. Shareholders of Delhaize would receive 4.75 shares of the new company for every Delhaize share owned. The Ahold shareholders would have 61% of the new company and Delhaize shareholders 39%.